The Man in Black: a legend, a hero. The thrill still lingers when I remember the day that Johnny Cash spoke my name. The resonant bass-baritone was unmistakable as its owner politely asked for me on the telephone more than a dozen years ago. Cash was, and remains, a hero of mine. And the day I got to interview him for an article in the daily paper for which I then labored was one of the high points of my journalistic career. Of my life, really. And now the Man in Black is gone. He was taken away last Friday after 71 years in this world, his death officially the result of complications from diabetes. But most of us knew he'd soon shuffle off this mortal coil after the May death of his wife and soulmate, June Carter Cash. June Carter, who was born into the country royalty of the Carter Family, essentially saved Cash's life by helping him kick his various addictions and encouraging his return to religion. They were married for 35 years and always performed together. In a 1997 radio interview on NPR, Cash said he could not imagine going on stage without his wife. And in the liner notes for his last album, he wrote that he likes nothing better than to come home and curl up with her. A towering figure in American music, Cash recorded more than 1,500 songs in a 50-year career during which he helped define country, rock and folk music for multiple generations. He had an iconic influence on our culture but always remained the humble son of Depression-era Arkansas cotton farmers. Other than Elvis Presley, Johnny Cash is the only performer who has been inducted into both the Country Music Hall of Fame and the Rock and Roll Hall of Fame. You may have been especially attached to signature Cash tunes such as "I Walk the Line," "Folsom Prison Blues," "Cry, Cry, Cry," "Tennessee Flat-Top Box," "Don't Take Your Guns to Town," "Sunday Morning Coming Down," June Carter's "Ring of Fire" or even "A Boy Named Sue." But Cash wasn't satisfied with being part of history. He began to redefine his career in the '90s with a series of four albums produced by rap-rock mogul Rick Rubin and released by American Recordings. Embracing songs by Leonard Cohen, Tom Waits, Tom Petty, Soundgarden, Danzig, Beck, U2, Nick Cave and other contemporary artists, Cash again was searching for the connections that linked musical artists, no matter the genre. It was probably no accident that the final installment in this series, last year's The Man Comes Around, overtly addresses death and redemption. The title song is a frightening view of Judgment Day, complete with quotations from the Book of Revelation. 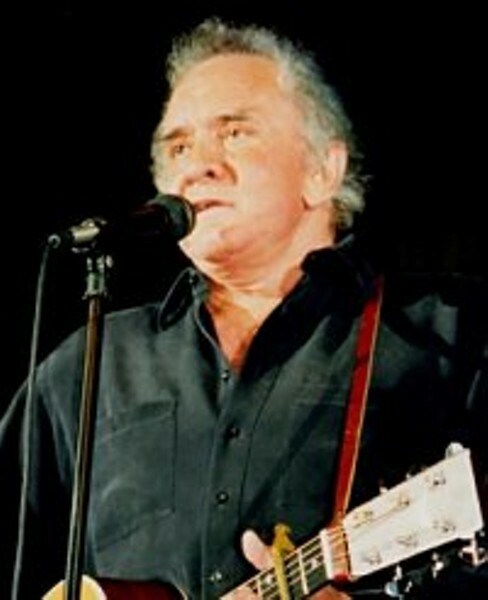 It was penned by Cash himself, as was "Give My Love to Rose," in which a dying man bids farewell to his wife and family. It won him his 11th Grammy Award, for best male country vocal. Reaching out for answers, Cash uses unique interpretations of Nine Inch Nails' "Hurt" and Depeche Mode's "Personal Jesus" to find new truths. And the traditional "Streets of Laredo" hasn't sounded as poignant in ages. But, believe it or not, Cash's recording of "Bridge Over Troubled Water" (with Fiona Apple on harmonies, no less) is the album's high point. Until Cash tackled it, I hadn't fully felt the sentiments of this Simon & Garfunkel tune for some 30 years. I believe that Johnny Cash has now crossed over that bridge.